Google “heraldry” and you’ll find a wealth of information on the ancient practice of using devices and symbols to identify individuals, armies, groups, and families. Arms were emblazoned on banners and shields and were also often worn on tunics. In the chaos that medieval warfare could readily become, they provided easy visual recognition of friend or foe. For the losing side in a battle, however, display of arms could quickly become a liability. We’ve all read about important personages fleeing the battlefield and discarding their tunics – an attempt to reduce their chance of being recognized by their pursuers. The professional herald is/was a master of symbolic meaning and nuance and uses these skills to craft simple or elaborate coats of arms to represent the bearer. Every color, every device, every decoration in a coat of arms has meaning. The position of each element imbues further meaning. There are rules about how elements and colors should be used. 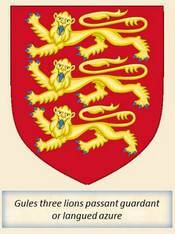 And the language of heraldry can seem incomprehensible to those not educated in the craft. We might readily infer the meaning of words like “field” and “tincture” or that “azure” means blue, but who would guess that “gules” means red? And what on earth is a lozenge, a tressure, or a saltire? One site that I found particularly helpful as a starting point for developing a basic understanding of heraldry is “International Heraldry & Heralds” (http://www.internationalheraldry.com). 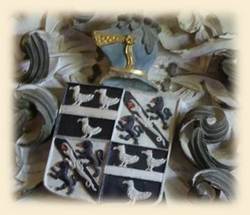 It provides considerable information about the construction and description of coats of arms, including many examples of the arms of famous people and places. The Wikipedia article, while not having quite as many images, also provides a good overview. Throughout the saga, I have tried to use symbols or devices for the characters who need them in a way that is reasonably consistent with heraldic practices, though I have made no attempt to actually craft coats of arms that would have been typical for the period. It might have been fun to attempt one for Alfred’s brother, John. However, in my careful but admittedly not exhaustive research, I didn’t find symbols reflective of his character. Though apparently used rarely in heraldry, the donkey is not aligned with our modern understanding of the term “jackass,” signifying instead patience and humility.